Hallwalls celebrates the 50th anniversary of the Association for the Advancement of Creative Musicians with a special performance by Chicago's Ethnic Heritage Ensemble, now over 40 years strong. 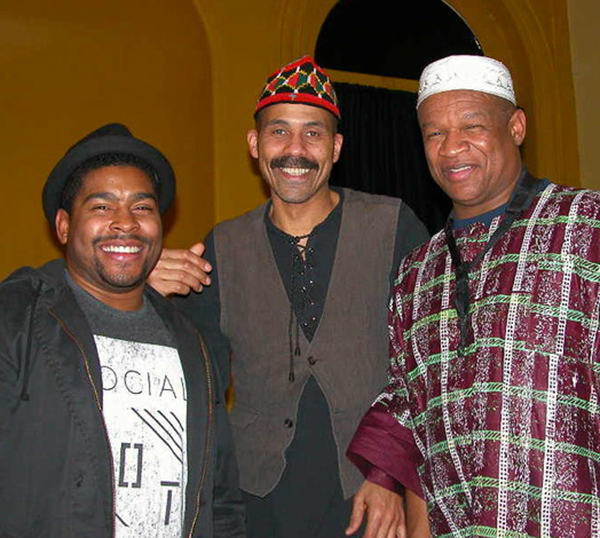 Kahil El'Zabar led its first performance at Child City Arts Center in Chicago in 1973, one year after he had returned from his studies at the University of Ghana. His goal was to combine concepts of African American music making with the earlier roots of traditional African music and make something new. After 40 years, this legendary band is still serving the people worldwide with their special brand of 21st century Griot music. The current band consists of the young trumpet titan, Corey Wilkes, along with Chicago Saxophone legend, Ernest Khabeer Dawkins and the award winning multi percussionist, vocalist, and composer, Kahil El'Zabar. The EHE is now in the pantheon of jazz history. Few bands have lasted more than four decades and there are no signs of this illustrious ensemble slowing down. Their music conjures a spiritual journey to the inner self. It spans time through multiple expressions that transcend styles and genres. There is an extremely personal virtuosity to the EHE's way of making music. It appears simple on the surface, yet when one goes deeper in the music they are amazed at the density of form. The Ethnic Heritage Ensemble's latest album, "Black is Back," is a superb musical effort. 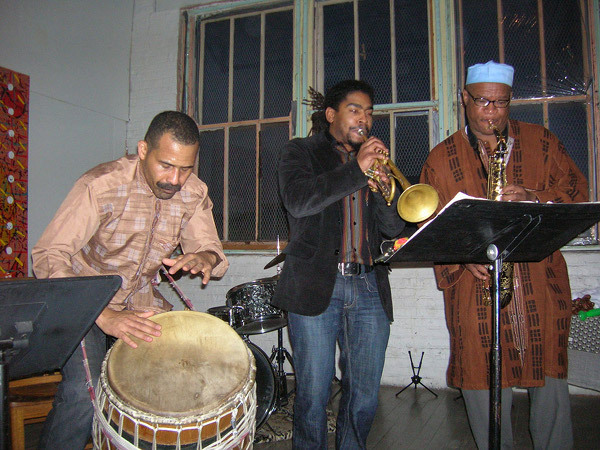 For forty years Kahil El' Zabar has led the Ensemble, it's origins stemming from the school and musical environment that the AACM had established in the 60's and 70's, and establishing itself as a premier jazz group. Many musicians have played in the Ensemble, from Pharoah Sanders to Kalaparusha Maurice McIntyre to Henry Huff. For the past decade the group has consisted of fellow Chicagoan musicians Ernest Dawkins (New Horizons Ensemble) and Corey Wilkes (Art Ensemble of Chicago). While their recorded output has been consistently excellent, they seem to have elevated their playing on "Black is Back." It starts with the title track that opens the album, with El'Zabar opening with a long solo, playing on thumb piano and percussion (as he does usually in live performances, with the percussion -- bells, chimes, etc. tied to his legs, making sounds by bringing his knees together or stomping on the floor). He fuses African griot with church music, blues and bop, something he's always done but here it feels more intense, more developed than in the past. Several tracks on this album are long, five over 8 minutes, which allows for a deeper, more intimate focus, resulting in engagingly hypnotic, spiritual sonics. "The Awakening of 2012" and "Be Bop" showcase Dawkins and Wilkes (with El' Zabar on drums), as both create a sound that recall Dizzy Gillespie and Charlie Parker's formidable years together in the 40's, a raw yet jubilant be bop sound that incorporates their contemporary free improvised phrasing. It feels nostalgic yet fresh. "Creole Peppa Stew" is a strong, hard bop track that recalls the work done from a more adventurous Blue Note or New Wave Impulse! album. "Who's You Mamma Who's You Daddy" combines El' Zabar's minimal percussive griot chant with the others' bop horn playing, softly at first, then building in intensity, Wilkes playfully soloing on top of the chants and gutteral vocalizing, then Dawkins taking a turn, before returning to all three, with El' Zabar bringing it on home with his infectiously grooving beat. Leader Kahil El' Zabar has described his own creativity as an emphasis on the spiritual over the technical, digging deep into one's soul and cultural roots to produce good art. This album, more than the others of recent years, exemplifies this, and should be considered a high point in the group's discography. Hallwalls Music Program is made possible through the public funds from the Music program of the New York State Council on the Arts, a state agency, &span; the generous support the Doris Duke Charitable Foundation.